Tuscan Traditional Poster Canopy Bedroom Collection. The impressive stature of this glamorous upholstered four post canopy bed was inspired by grand European elegance. The four columns boldly support the iron canopy which graciously intersects in the center of the bed joined by a beautifully carved wooden ornament. The four pillar tops are elaborately carved and topped with a marble egg for a decorative touch to the traditional design. The headboard is upholstered in a rich, dark brown bonded leather for uncompromising comfort and luxurious style. Three spacious drawers provide storage and add functionality to this beautiful night stand. The traditional style of the carved details and antique hardware makes a great companion piece next to your bed. Carved details provide impressive style to this traditional dresser and mirror set. The storage drawers offer plenty of room for organizing clothing and other items. The shaped landscape dresser mirror with carved crest matches the headboard of the coordinating upholstered bed for a beautiful look. The beveled mirror adds utility as well as beauty as it reflects light in your room and helps streamline your morning routine. The optional matching drawer chest features the same carved details and stylish amenities as the coordinating pieces and will provide plenty of additional vertical storage for clothing and other bedroom essentials making this piece as functional as it is stylish. This stunning traditionally styled collection is dramatic and graciously scaled accented by distinctive decorative carvings. Crafted from select Birch hardwoods, enhanced by beautiful molding on the doors and drawer fronts and carved accents, This collection will provide an impressive focal point to your traditional Master bedroom. The upholstered headboard of this impressive four poster canopy bed is bonded leather for timeless appeal and significant comfort. The dresser and night stands feature beautiful marble topsand ample storage space. The elaborately carved details of the elegant headboard set the impressive traditional tone. 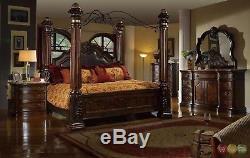 This listing includes the king bed, night stand, dresser and mirror only. Additional night stand and matching drawer chest are also available, but not included in this listing. We will do anything within reason to favorably resolve any issues. We strive to be a 5 star company, and we are committed to providing outstanding customer service in order to earn 5 stars in all categories. Every effort is made to provide high quality, accurate images to assist you in selecting your furniture. However, images may vary in color depending on a number of factors including but not limited to individual computer monitor color settings, photography, lighting and natural variations. Please note: ShopFactoryDirect is not responsible for color variations or measurements that are slightly off (three inches or less). Please keep in mind that photography, computer monitor settings, wood staining process and fabric dye-lots on each individual piece may cause slight color variations. Therefore the item you receive may not be an exact match to what you see on your computer screen. The team at Shop Factory Direct is committed to providing you with outstanding customer service. Please note: some addresses in very remote, rural areas mountains, very narrow or unpaved roads, etc. Or urban roads with limited access excessive tolls/high traffic/one-way streets, etc. White glove also includes removal of discarded packaging materials if requested. Please allow up to 2 weeks for your order to be delivered. Although we do our best to get your order to you as quickly as possible. Unexpected delays are sometimes unavoidable, so please be patient. If the packing slip indicates a different box count than what is delivered, make sure you. Minor damages will be restored to first quality by a professional furniture restoration technician. Our office is open Monday through Friday from. Sales staff may be available to answer questions over the weekend. The item "Traditional King Poster Canopy Leather Bed 4 Piece Bedroom Set Marble Tops New" is in sale since Monday, April 18, 2016. This item is in the category "Home & Garden\Furniture\Bedroom Sets". The seller is "shopfactorydirect" and is located in Chino, California. This item can be shipped to United States.